Like I said, I had a general idea of how I wanted this long wall of our family room to look and also function. I have been picturing built-ins to the sides of the fireplace as well as modernizing the overall look of the washed out, brick surround. Here is a look at the most recent, before photo. Is it terrible? Of course not! I had previously painted the orange, oak mantle a nice bright white and when it was styled, I didn’t hate it. I just knew it wasn’t living up to its potential! I started to paint the bricks, I thought if it was all white, that would bring the change it needed. When that fell short, I decided I wanted to cover the brick and make the fireplace appear as though it runs from floor to ceiling! Step one…cover the brick with wood panels that I would paint. I used construction grade pine in a few sizes because I needed to build out the wood frame to be flush with the brick step out under the mantle. You can see that step in the following photos. I created wood firing strips to be even with the stepped out bricks directly under the mantle. I screwed the pine boards directly into the bricks. I used a combination of my Ryobi drill to pre-drill the holes in the stone and wood along with my impact driver to drive the screws in through the wood into the bricks. Once the wood firing strips were attached across the front of the stone, I chose to use wood I already had on hand to complete the remainder of this project. This allowed me to save on costs as well as make some more room in my garage! I used 3/4” plywood underlayment that I already had cut into 8” planks. I cut them to size and ran them left to right and nailed them directly into the wood strips. I covered the front as well as the sides. I continued the wood planking from the top of the mantle up to the ceiling. I went back to my wood pile and pulled some pieces that would work for trim. I trimmed out the sides and around the fireplace box as well as the left and right up to the ceiling and topped it off with a piece of molding along the ceiling line. Already such a big difference! Next up comes the “built-ins” that I want to add on the left and right sides. I decided to do an IKEA hack using the Billy Bookcases. After some measurements and knowing I wanted the shelving to completely fill the wall from side to side, I purchased 6 Billy Bookcases in the 31.5” width. The total of 94.5” was about 5” too wide for my walls, but I knew I could modify the size of the middle book case to allow 3 units to sit side by side on each wall. The following pics show the bookcases as they begin to go together and be set in place. As you can see, I built the 4 cases that will stay as is and set them in place. I then took the measurements of the remaining space left between and cut the pieces down of the remaining 2 shelves to fit into the new space before assembling. I used painters tape where the saw was going to cut to keep the melamine finish from splitting. Works like a charm. Here you can see the 6 total bookcases in their place. At this point they are just sitting in place as we had to wait for help from an electrician to mount our TV above the fireplace and to hide the cords in the wall and behind the bookcases. Since we were having an electrician come out, we also decided to add wall sconces above each set of shelves. Once the electricians were done, I added trim to the book cases to attach them to each other as well as create the finished, built-in look. In addition to the trim on the bookshelves I decided to add some dimension to the walls above! I simply nailed 1x1 pine trim to the walls at the same spacing height as the seams in the planks over the fireplace. I continued the lines out to the left and right and it creates a look I’m deciding to call, revers shiplap! I finished up the trim on both sides and then came the part that ended up being such a hard decision for me! I surprised myself as I am usually very decisive when it comes to finish work colors. In this situation, however, I was so torn! If you follow me on Instagram, I’m sure you saw me continually wavering between all white, all black, a combination of black and white! I was all over the place in my mind! After a week of deliberation I chose this black color…. I went with Carbon in a matte finish by Behr paint. However, I STILL wasn’t absolute about what, exactly, I was painting black! I did however decide that the fireplace would be black for sure! So I started there. After seeing that complete, final decision was made and I chose to do the book cases as well as the walls above in white. I use Behr, Ultra White for everything, keeps it simple! For contrast we chose black sconces and I painted the mirrors I had previously found at Home Goods, black also. A few source notes about where the other details in the room are from because I know you all will ask! The “art” above the fireplace is actually The Frame TV (yes a TV!) from Samsung. It has hundreds of images stored in the TV or you can add and upload your own from a phone. It also takes different color frames (sold separately) that just click right on with magnets! We chose the natural wood option. The furniture we selected with custom upholstery at a local furniture shop to NE Ohio, Wayside Furniture. The couch, both club chairs as well as the double ottomans were from there. The beautiful striped rug is from Annie Selkie and its the Dash and Albert line, in the Birmingham Stripe finish, 8x10’ size. The mirrors I found at Home Goods and I repainted them black. The wall sconces I found on Amazon by searching, modern farmhouse wall sconce. The table under the window I purchased from Tuesday Morning. All other miscellaneous decor I’ve collected over time and I pulled it out of my overflow decor storage! Oh, I almost forgot to show you how great the black fireplace ties in with our newly remodeled kitchen! I love when a project comes together in real life even better than I pictured in my head! Let’s take a look at the before and after one more time! 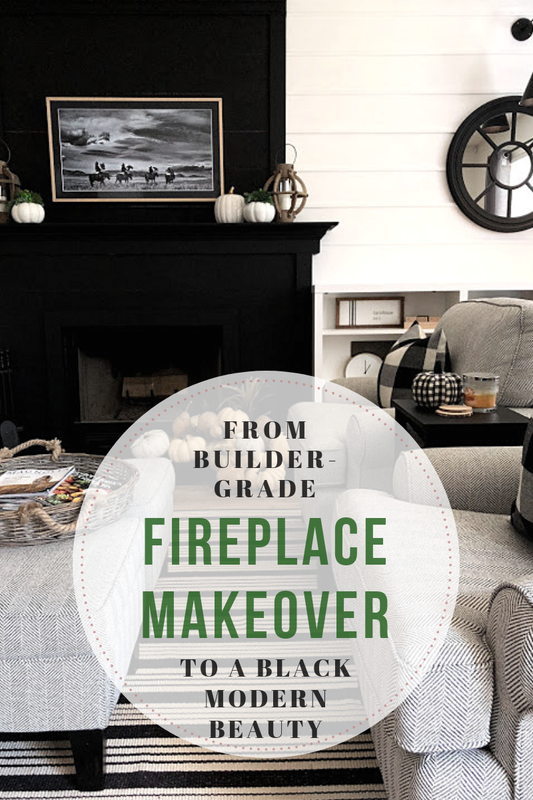 Thanks for joining me as I take you through the steps of changing our builder grade fireplace to a black, modern beauty! I had to get this blog post completed, but we have one more fun addition I’ll be adding here before I get all decorated for Christmas… a gas log insert! So I can have a fire at the flip of a switch! So I hope you’ll come back to see that final touch when it’s time for the Christmas home tour!